Welcome to the August 2014 newsletter! This month is an important birthday for all the Urban eXperimenters: ten years ago, the Parisian police discovered the underground and clandestine cinema built by La Mexicaine De Perforation. August means also the money machine event that is Burning Man. "Piss Clear" was an independant and alternative newspaper which covered the festival during 13 years. It will be our back list item. The alternative newspaper Piss Clear covered during 13 years the festival. Exploring the ways in which visual culture develops in public spaces and how it shapes those spaces. Complete book describing the Murales of the Suprema Corte de Justicia in Mexico city. 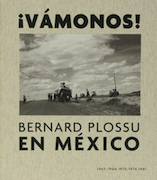 Fifteen years of photography in Mexico by Bernard Plossu. Copyright © urban-resources.net - August 2014 - All rights reserved.